This creative vacation rental was designed by an extremely talented local artist. It is a short walk to downtown Bar Harbor, the shore, and offers easy access to Acadia National Park. The Island Explorer, located downtown, offers a free bus service to anywhere on the island. Located in a residential area, the top floor of this renovated home is a picture of serenity, peace and quiet. Surrounded by tall trees, the space is reminiscent of dwelling in a luxurious tree house! Enjoy brilliant stars on a custom stargazing bench, relaxing on a walkout deck off the master bedroom, or sitting on the private covered front porch. The spectacular bathroom is the showcase featuring a one of a kind breathtaking tile creation. As you sit in the jacuzzi tub you will be swept away into a vision of Frenchman's bay featuring the elusive Orca whale. Not your average run of the mill vacation rental. Words can not describe what it has to offer. Golfing: The historic Kebo Vally golf course is located just over the hill, offering world-class golfing. Children: Directly across the street you will find Glen Mary woods, a city owned park, adjacent is the Glen Mary wading pool, perfect for younger children. Picnic are, restroom and swings are located next to the pool. massage: On site massage available. Jacuzzi, stacked washer/dryer, double vanity. Kitchen has everything you need to do a lot of cooking. We found everything we needed. The apartment was cozy, spacious and clean. 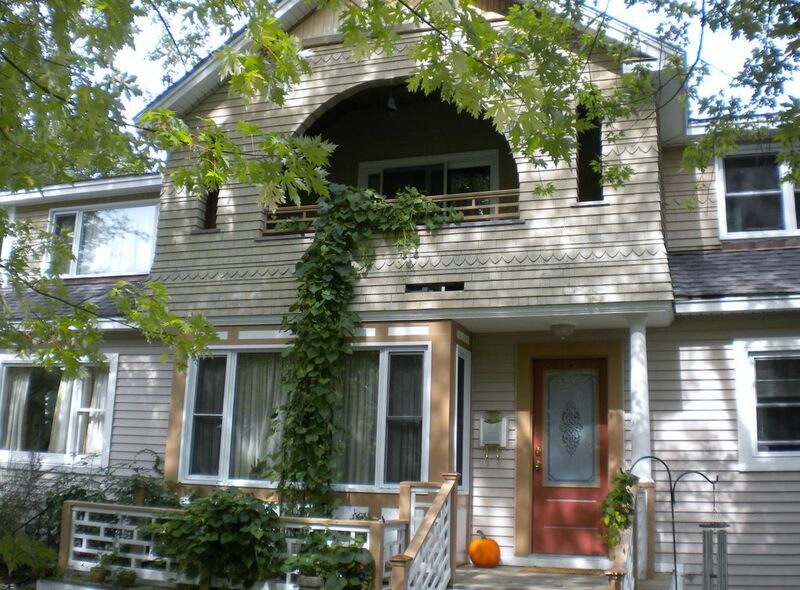 The property location in Bar Harbor is excellent, quiet, near shops, and restaurants. The owners of the apartment, were helpful and cordial. Lots of room at this place, with everything needed to cook if needed. It is very convenient to Acadia National Park. The place was clean and had plenty of room, with free wi-fi and plenty of channels to choose from on TV. The hosts were available if needed as they live below the apartment. All in all a great place to stay and I can easily and heartily recommend. Great location with a lot of character in downtown Bar Harbor! We enjoyed a great long weekend over New Year's Eve with another couple. We were very comfortable and were able to walk to restaurants for dinner. Loved the jacuzzi tub and heated bathroom floor. The kitchen was well stocked with most of what we needed to cook meals. Plenty of privacy with the separate entrance. We loved the lit Christmas tree on the outside deck. While only having 1 bathroom worked for the 4 of us, it might be a bit tight for more people/adults and the living room has comfortable seating for 3-4 adults. We would definitely stay here again! we were completely enchanted with our accommodations! The facility was neat and clean and cozy and welcoming. It was very well outfitted. The location is quiet, but with a short walk to town and to other walks. We highly recommend this place! Cozy, Clean, & Plenty of Room! The property is perfectly situated in Bar Harbor. The owners live downstairs and you have the entire 3 bedroom and 1 bath upstairs. They give you privacy and there is a separate entrance in the back to the upstairs. You can hear there are people downstairs, but it's no big deal (just like a hotel where you know there is someone next door). You just park your car and you can walk to Downtown Bar Harbor and it's a short drive to Acadia National Park. The apartment has everything you need that your own home would have. If you forgot something, they have it. It is like you are at home. Oh, also, if you go in the winter time, the beautiful bathroom has a heated tile floor. I guess that is standard in Maine? I don't know, but in Florida, that is not the norm. We just kept the bathroom door shut and when we got up, the bathroom was nice and toasty. The only negative (not for me but for the hubby) was that the TV is very quirky and complicated and didn't get a lot of channels. I could care less about television but if you're married to a TV watcher :( and this is a priority for you on vaca, then that is the only downside. Very nice and clean. It’s within walking distance to downtown and a few minute drive to Acadia National Park. Will recommend to friends and would like to stay again next time we are back this way. Bar Harbor Maine is located on Mount Desert Island which is the home of Acadia National Park. The Island features many beautiful mountains, harbors and lakes. Historical carriage roads offer excellent access to the park via foot, bike or horse! The summit of Cadillac mountain is world famous for spectacular sunrises and sunsets. Frenchman's bay is ideal for any sort of boating activity, especially kayaking. The humpback whales spend their summer in our waters, a whale watch is a must! Bald eagles soar through the air, seals lounge on the warm rocks and deer roam through the park along with many other types of wildlife. We offer the best lobster in the world, even lobster ice cream! Fine food, music, art, upscale nightlife and shopping are just a few things you will find in Bar Harbor. Mount Desert Island is a magical place. Golf: Kebo Valley golf Club is just a mile away...the 18th oldest golf course in the United States. The course is sorounded by the majestic mountains of Acadia National Park, offering a spectacular setting as you play the course. When you come to Bar Harbor don't forget your clubs. All the rates, except Winter are set on a weekly basis running sat.-sat, check in starts at 3:00 pm, check out by 10:00 am. During the winter season we have a three day minimum. The deposit, due upon signing the lease, is half of the total rate, the remainder plus the 9% lodging tax and separate $200 security deposit check is due 30 days before arrival. We hold your security deposit check and only cash if necessary to repair any damage, otherwise we return it to you immediately after checkout.